Oh no, not more Ice Dancers! I'm afraid so - we are not done lambasting the hapless ice dancers yet! We must revile the costumes of the established stars to make room for the ones waiting in the wings! Surely new stars will be born this season, leading up to the Olympic Games in Torino. How will we face ourselves if we ignore today's skaters only to move on to the fresh meat of the newcomers? Our focus today is on the Israeli ice dance team of Galit Chait & Sergei Sakhnovsky. They are very talented and have been around for awhile. However, this does not excuse their taste in skating fashions. 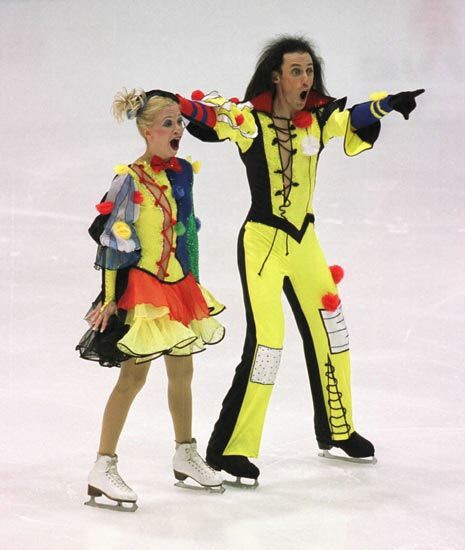 They are second only to Kati Winkler & Rene' Lohse (see previous posting) in the Hall of Ice Dance Fashion Horror. Let us begin. Here they are at the NHK Grand Prix in 2003. I cannot begin to guess who makes their costumes - is it someone who also makes clothes for demented dolls with creepy china heads? Or is it off-the-rack stuff from Wal-Mart that is torn up into rags, then sewn into skating costumes? Or is it that weird lady you always see in the Republican National Convention television broadcasts who is wearing American flag colors, a straw boater, plaid, and way too much makeup? If it is the latter, how did they get her phone number? This is known as felony abuse of flesh panelling. Furthermore, we do not know what sort of creature has landed on her chest, nor do we want to. Some things are better left as mysteries. The basic concept of the costuming for this 2004 number is not bad - except for the COLOR. This shade of "lime" is not now, nor has it ever been, found in nature. It may in fact be some sort of radioactive isotope with a half-life of hundreds of years, so back away very slowly and don't take your eyes off it. On second thought - please do. From 2001 Skate America - any ideas on what the heck she is wearing? Me neither. Looks like an apron made from a garden trellis, with fringe on it. Plus you can't see it in this pic, but there is way too much flesh panelling in the back, and more trellis! His fringe just looks like an afterthought; "Hey, could we get some fringe over here, or did we use it all up on her?" His shirt is so poofy it looks like he could just fly away if he flapped his arms a little.. .
And now we come to the most amazing outfits you have ever seen - and you will wish that you had never laid eyes on it. Please shield this image from young children, or the old and infirm. If there is a circus in Hell, this is what the clowns are wearing. You can count on it. This Ice Dance team is still active and Olympic eligible, so who knows what this season will bring? We will be on the lookout to see if any of the younger teams can come up with anything to top this - and we fervently hope they never do. Does it depress me that Slutskaya will be Olympic champion? Answer to original question: F**k yeah. Any current American woman, any current Canadian woman, any current Japanese woman, Poykio, (dare I say it) Koestner, Fontana, and so many others would be a far better Olympic champ than Slutskaya. But not Sebestyen. Unless she changes her hair and stops wearing it like a 65-year old. And stops wearing 1/2-1/2 drag outfits for a long program - wtf. And not Volkchkova. Seriously, the Russians have to have some woman better than these two not already skating pairs or dance *somewhere* in that darn huge country. As for Slutty: I hate her crappy-a** costumes. I hate how she & Plushenko have given the Biellman a bad name. I hate her lame attempts at spirals. I hate her mime of dealing cards. I hate her perky interviews - for f**k's sake, she's married, lived through several near death experiences, her mom is sick, and she still has perkier, more child-like interviews than a 13-year old. You're not the Russian equivalent of Bai Ling.